From the seat of your favorite chair take a safari to Tanzania. 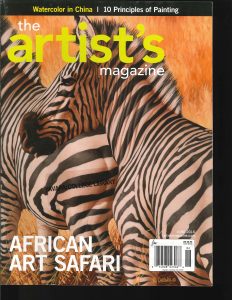 See the product of the Artists Ambassadors Against Poaching project dedicated to elephant conservation. This topic speaks volumes to me personally, having spent 6 years of my life running back and forth to Kenya. For the artist within, find the caption that gives you the 10 basic principles of painting. Then grab a brush and either do your hair or produce something on canvas just for you. If you have been to Yellowstone, it’s a good time to revisit with this issue. Review the changes in land management, the elk, the wolves, the bison, the geysers, the hotpots: the American Serengeti. This is a MUST read for anyone interested in our country’s actions and inactions on the global scene. So much has been written about our country’s foreign policy. In this issue Washington correspondent, Jeffrey Goldberg, interviews President Obama. 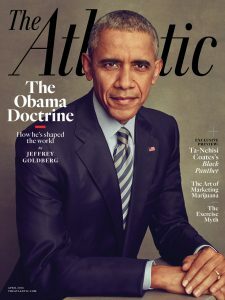 They discuss “The Obama Doctrine.” After reading this article you wonder if our allies and foes have a clearer picture of what our country stands for under this Administration. Grab your soft shoes and let’s boogie! “Let’s dance! How rhythmic motion can improve your health.” Both music and exercise help prevent and alleviate disease. Fusing the two may have even greater benefits than either alone. It has been shown to improve balance, memory, lower blood pressure, etc. So get your loved ones off the hammock and/or easy chair – and DANCE. A special note: Homeland Security does not require a passport to venture into this magazine. Our home (Earth) has more to see and learn than one lifetime affords. Take a short cut and open this magazine. 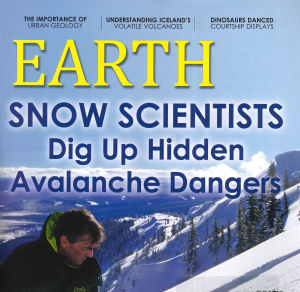 This issue caught my interest: “The importance of urban geology,” “Iceland” volcanoes,” “Dino Dancing” – (they even knew it’s importance back in the good ole days), and “King’s Highway: crossroads of ancient Jordon” (Petra).